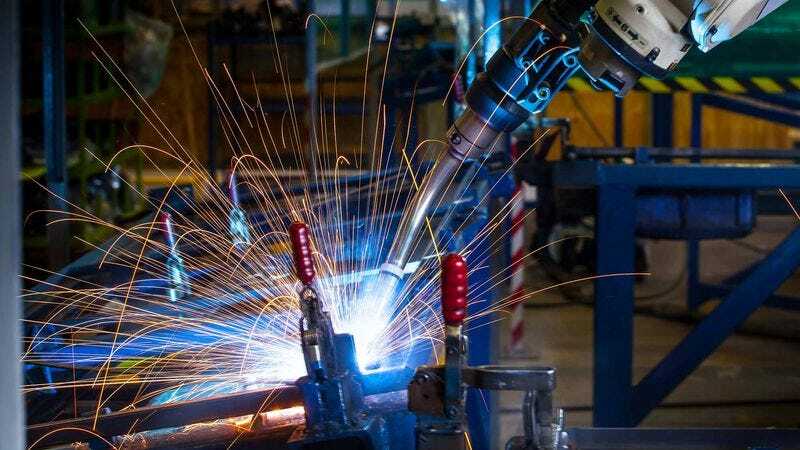 NORTH CHARLESTON, SC—Saying it had been mulling over the “fun little side project” for a while, an Electroimpact Quadbot reportedly put in some extra work after hours at the Boeing assembly plant Wednesday to try out a few of its own original designs. “It’s just something I like to tinker around with after I wrap up all my regular tasks for the day—plus, nobody here seems to mind since they were planning to throw out most of the scraps I use anyway,” said the four-armed, 30,000-pound robot, adding that the uninterrupted quiet time allowed it to experiment with various techniques and contemplate design problems more clearly and creatively than it could during business hours. “It’s a nice way to unwind after a 19-hour shift of drilling, applying sealant, and inserting fasteners into aft sections 47 and 48. Kind of helps me approach my craft in an unconventional way, you know?” The Quadbot added that it hadn’t told any of its four identical coworkers about the project, instead preferring to surprise them once the prototype was fully functional.